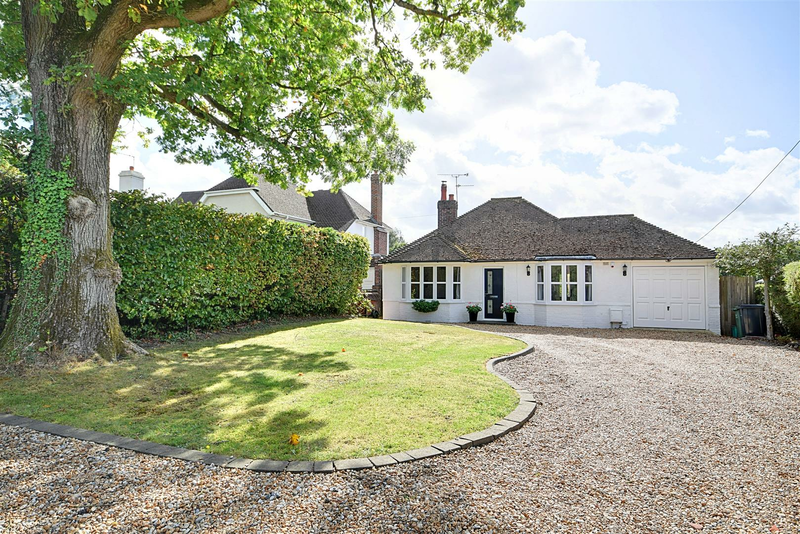 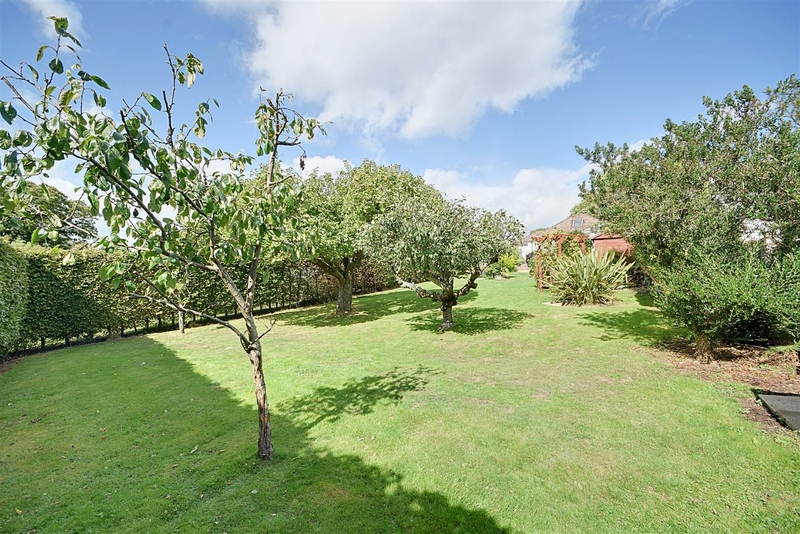 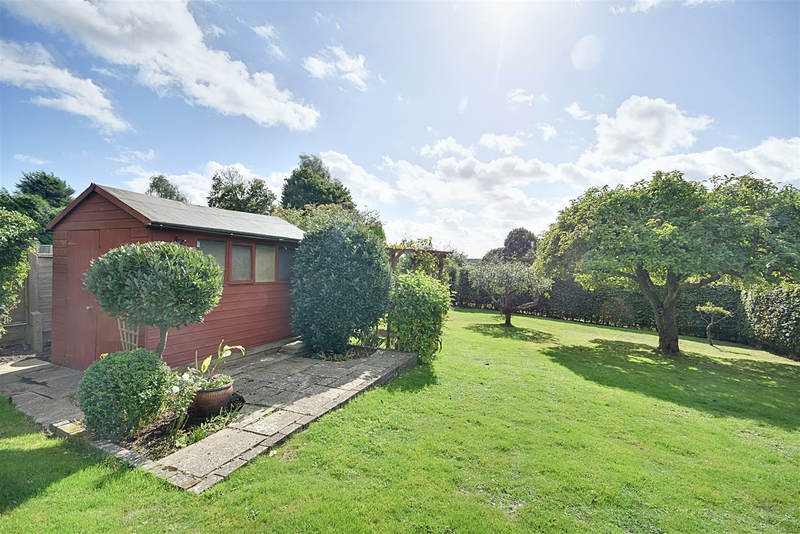 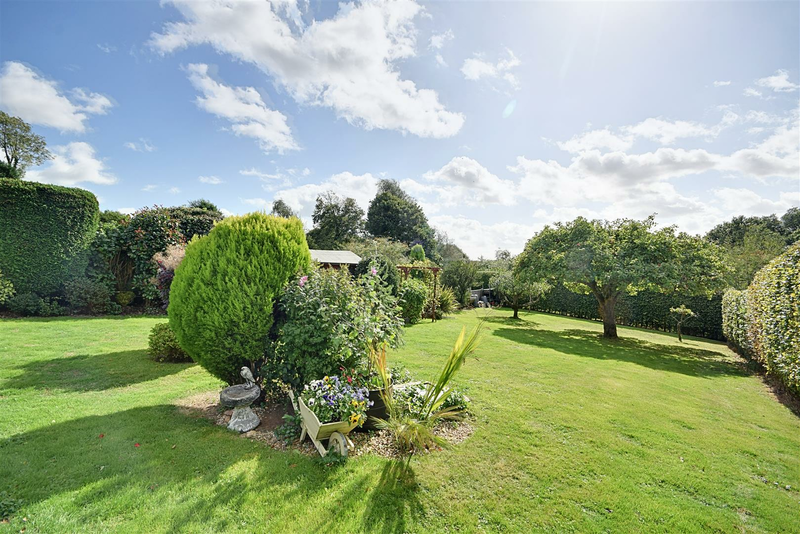 CHAIN FREE – A beautifully presented two bedroom detached bungalow occupying a favoured position of Broad Oak Village enjoying country views over a large south facing rear garden. 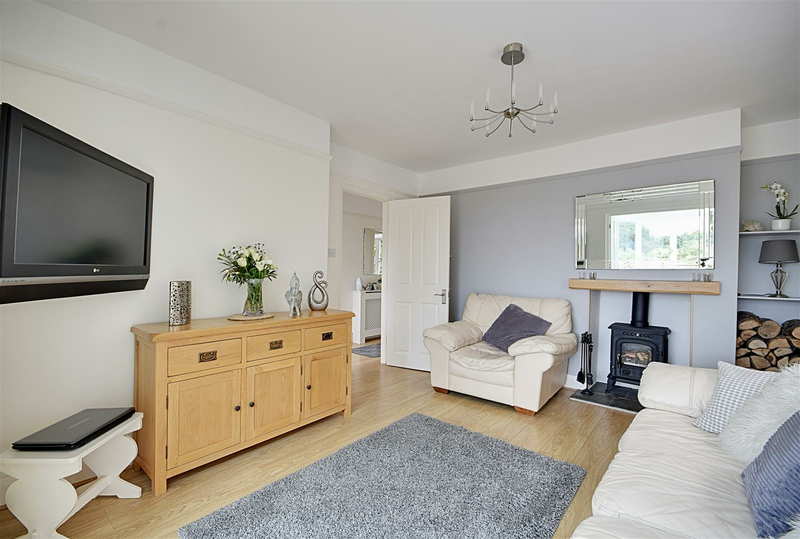 Accommodation currently comprises two good sized double bedrooms with bay windows to the front, attic room, stylish kitchen with Quartz work surfaces, fitted Rangemaster oven, useful larder cupboard and aspect to rear garden, main family bathroom, spacious main living room with multi-fuel stove and adjoining conservatory. 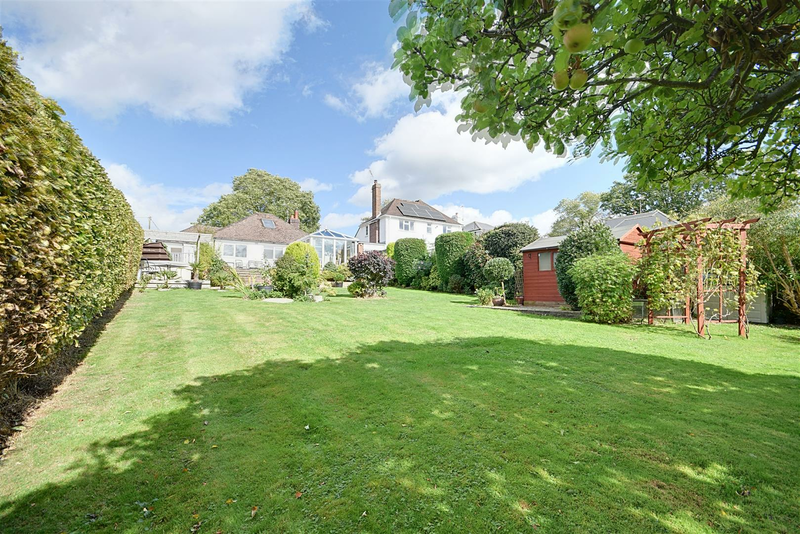 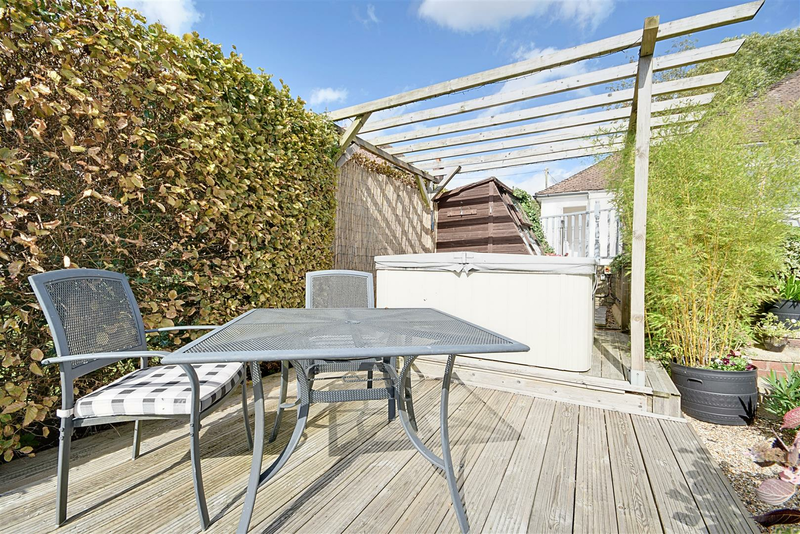 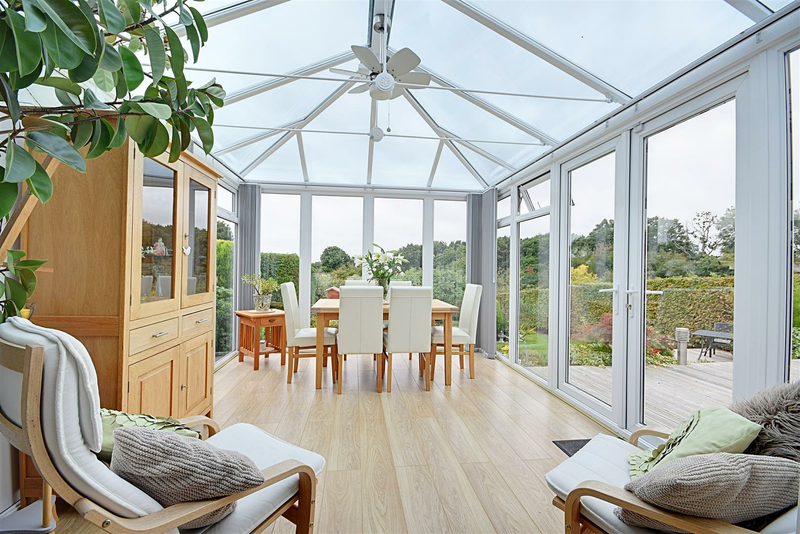 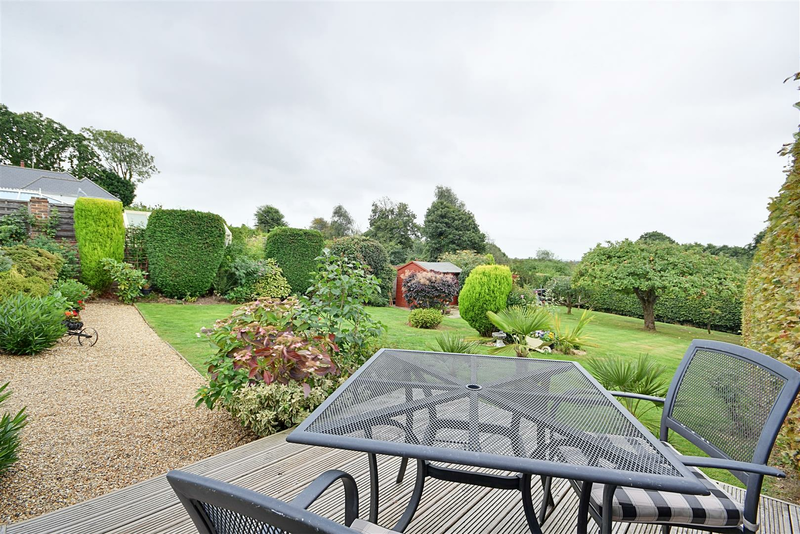 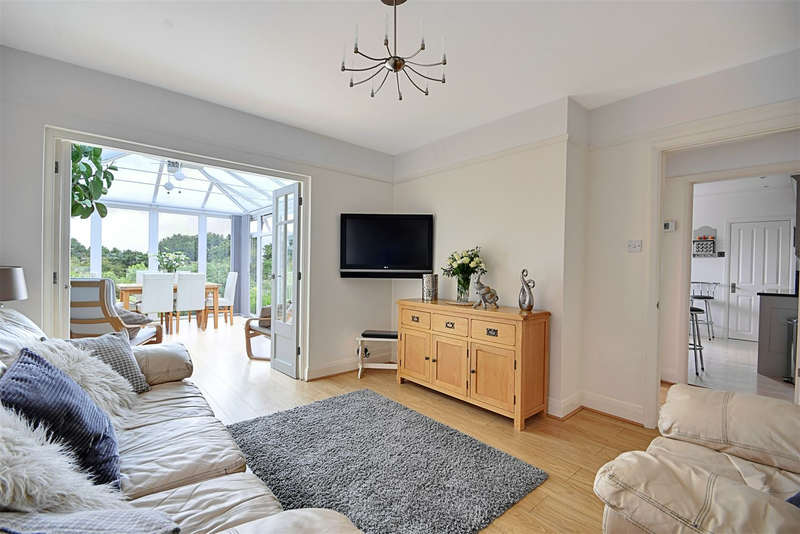 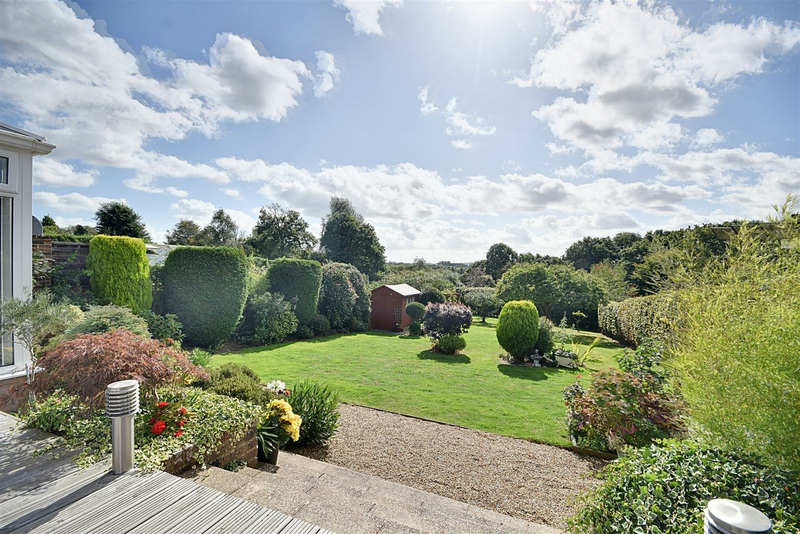 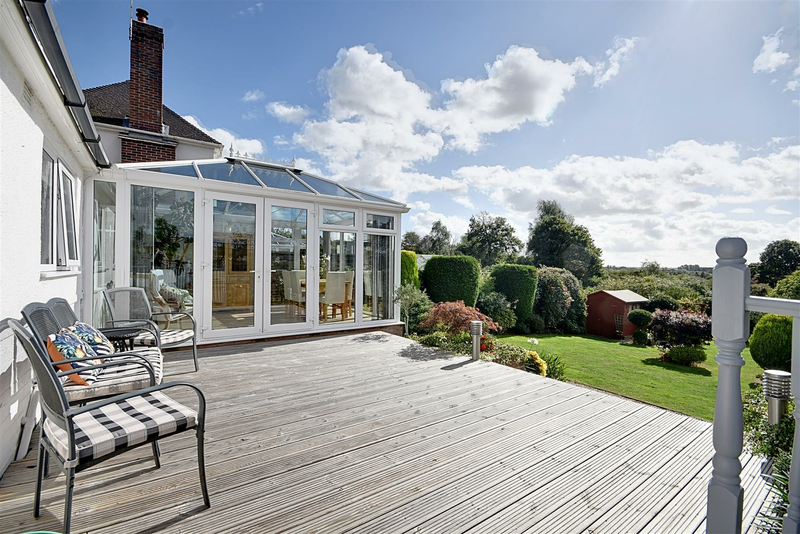 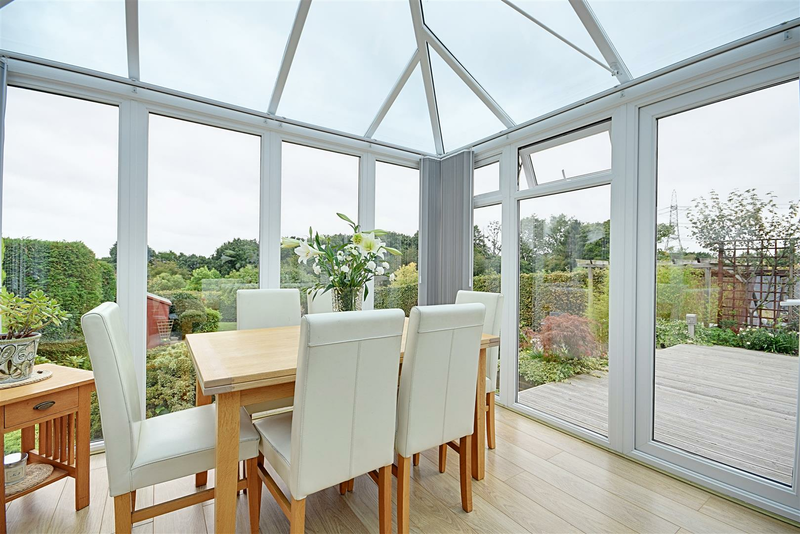 Outside offers a generous decked terrace offering an excellent seating/ entertaining area over the landscaped rear gardens, additional seating / hot tub area, freestanding shed / workshop and orchard. 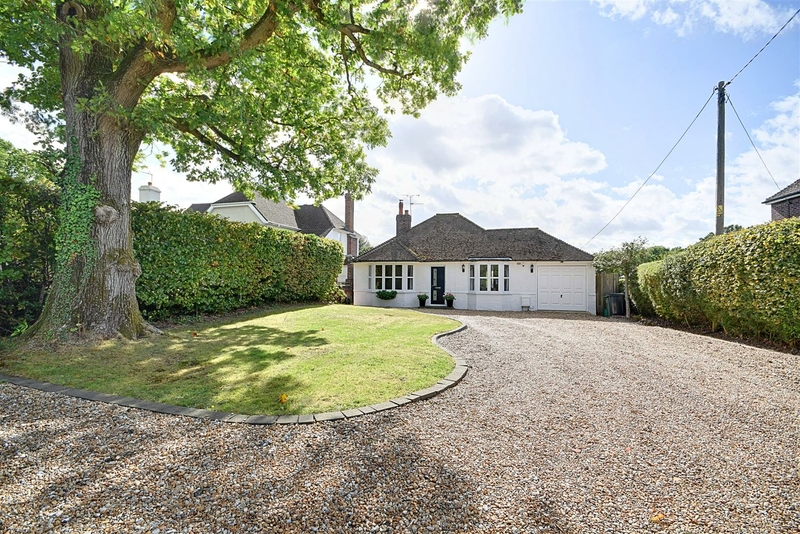 To the front offers ample off road parking over a shingled drive leading to adjoining garage which has been part converted into a useful utility room. 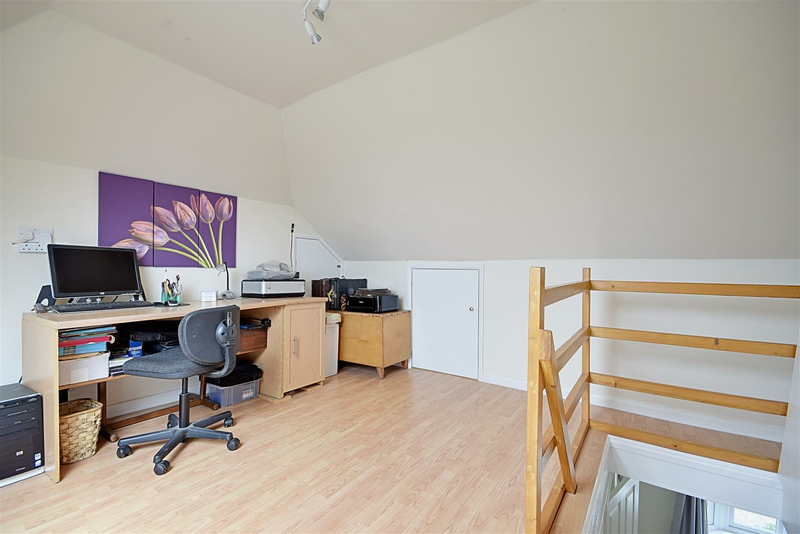 The property offers excellent potential for any prospective new owners to extend / convert attic space above subject to obtaining the relevant permissions. 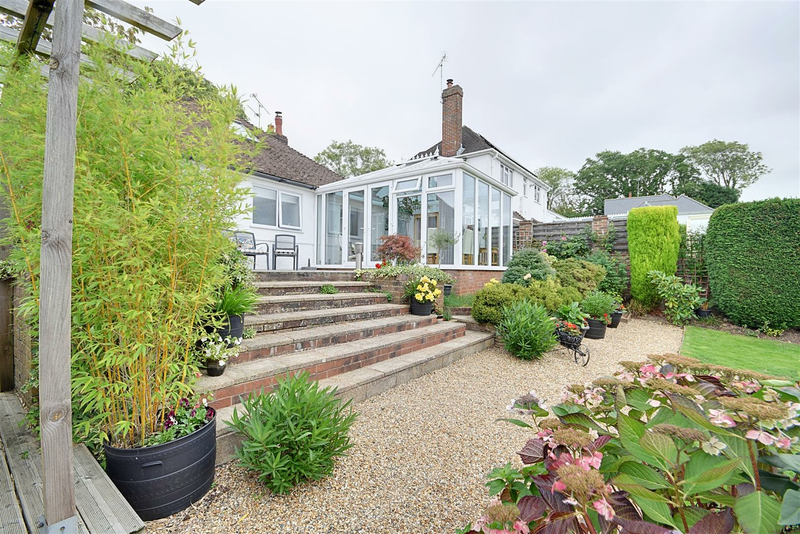 Brick edged shingled drive to front providing ample off road parking, front garden laid to lawn with mature Oak tree, close board gates to both side elevations, external lighting and block step leading to Composite front door with obscure viewing pane. 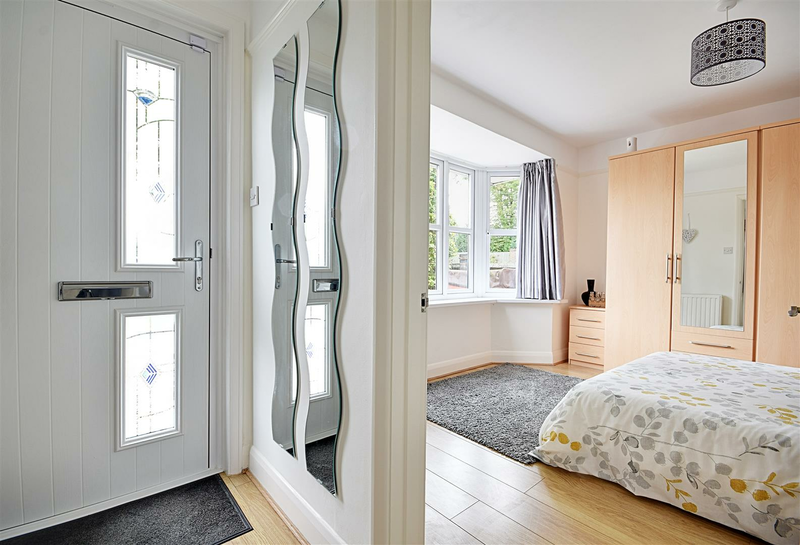 Internal door, oak effect laminate flooring, bay window to front elevations, single radiator, fitted cupboards complete with hanging rail, shelving and light, internal door to en-suite shower room, TV point. 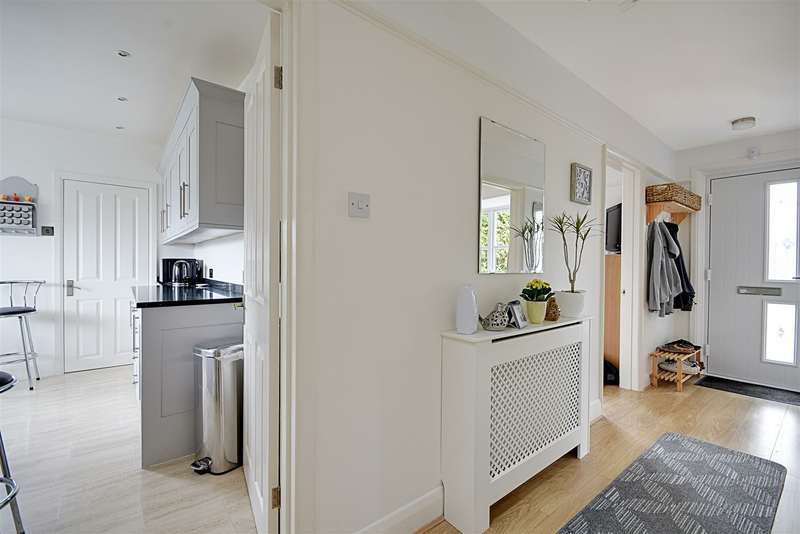 Internal door, oak effect laminate flooring, shower enclosure with bi-fold door and wall mounted shower mixer, push flush WC, wall mounted basin with tile splash backs, chrome heated towel rail, ceiling down lights and extractor fan. 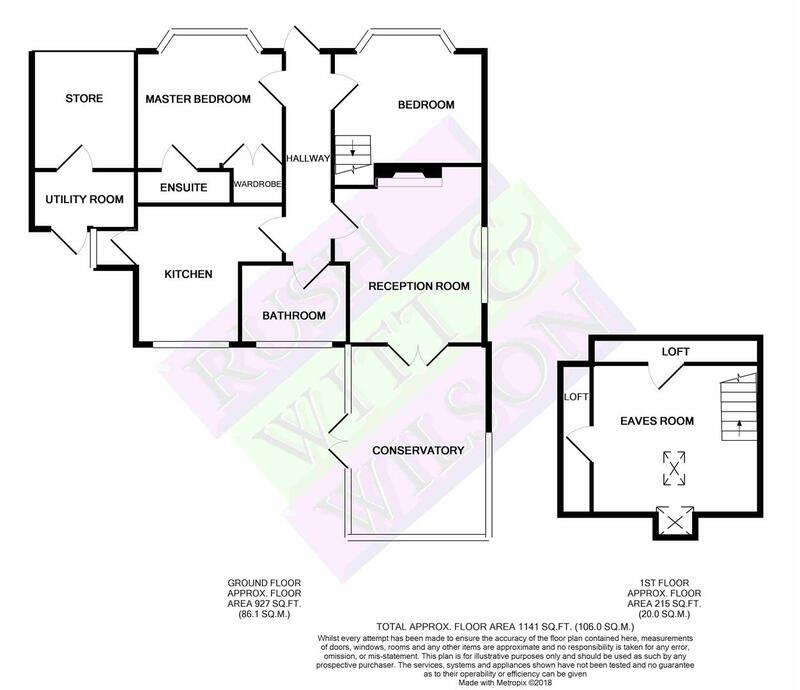 Internal door, oak effect laminate flooring, bay window to front elevations, open tread staircase to attic room, single radiator. 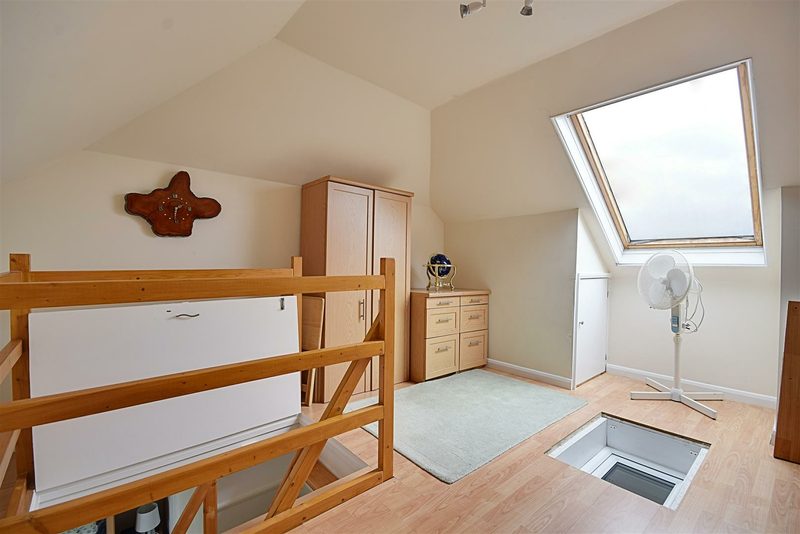 Open tread staircase from bedroom 1 with wooden balustrade, Velux window to rear elevations, inset floor mounted UPVC skylight to hall below, various eaves storage cupboards. 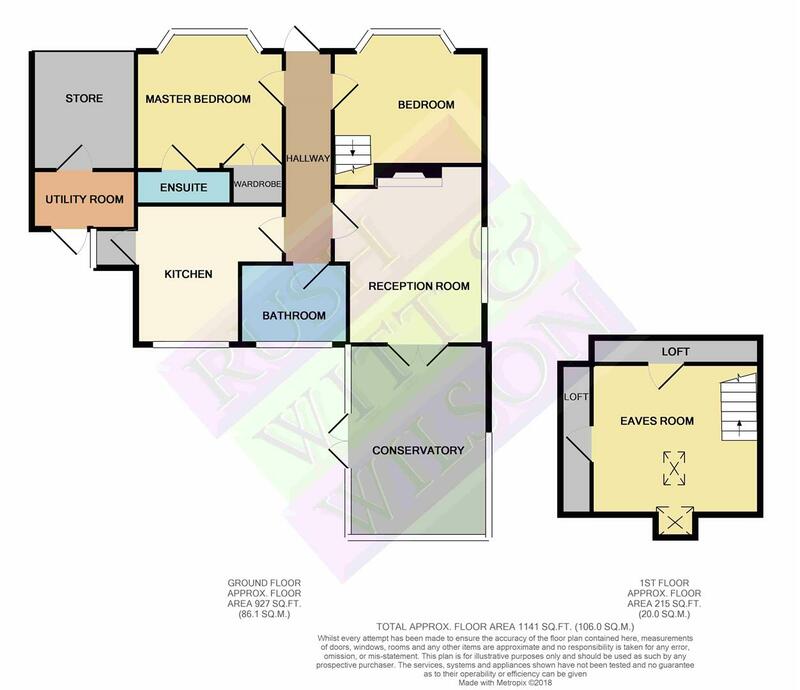 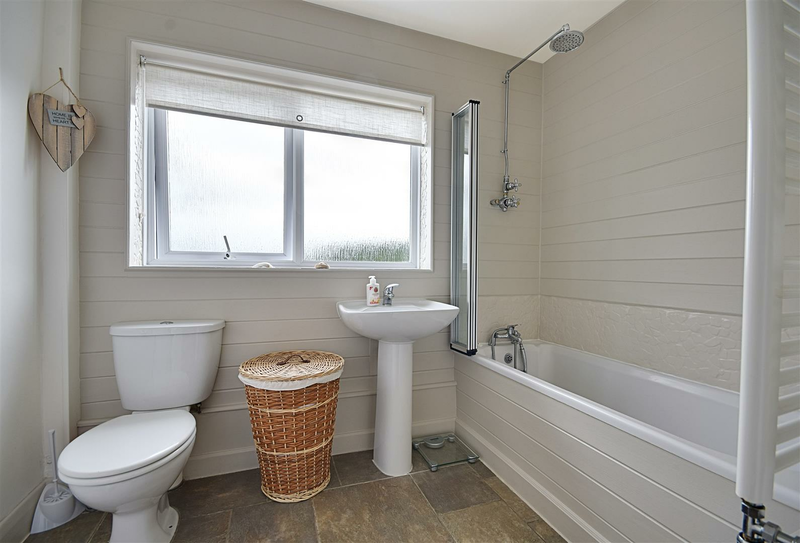 Internal door, tile flooring, obscure glazed window to rear, pedestal basin and WC, heated towel rail, bath suite with traditional shower system over, bi-fold shower screen, painted tongue and groove panelling. 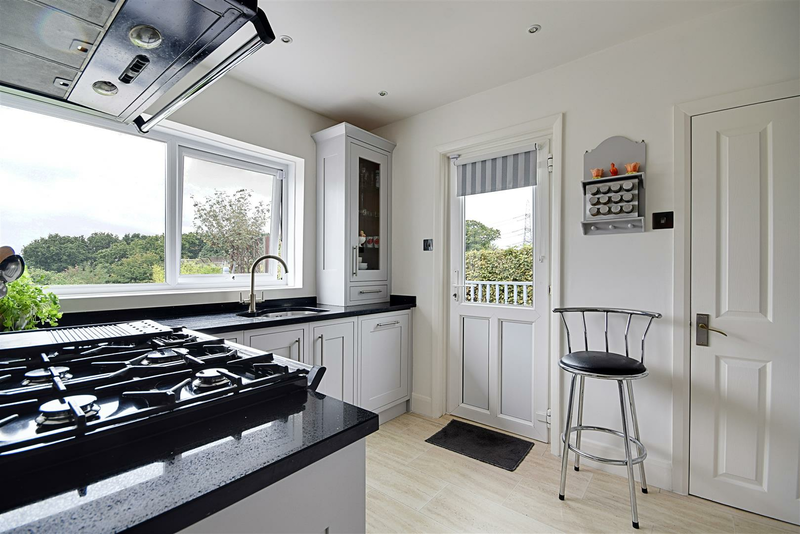 Internal door, granite effect effect laminate flooring, window to rear elevations with views to gardens, kitchen comprises a range of fitted base and wall units with shaker doors beneath Quartz work surfaces and matching up stands, fitted Rangemaster Classic delux 90 double oven, extractor canopy and light above, various above counter level power points, one and half stainless bowl and swan neck mixer taps, integrated Electrolux dishwasher, integrated fridge, internal door to walk-in larder with window to side, further external door to decked terrace, ceiling down lights, intruder alarm system. 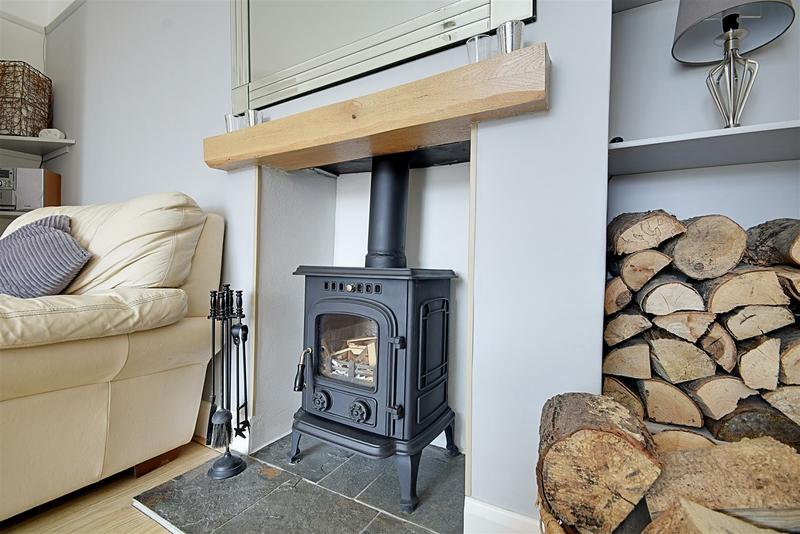 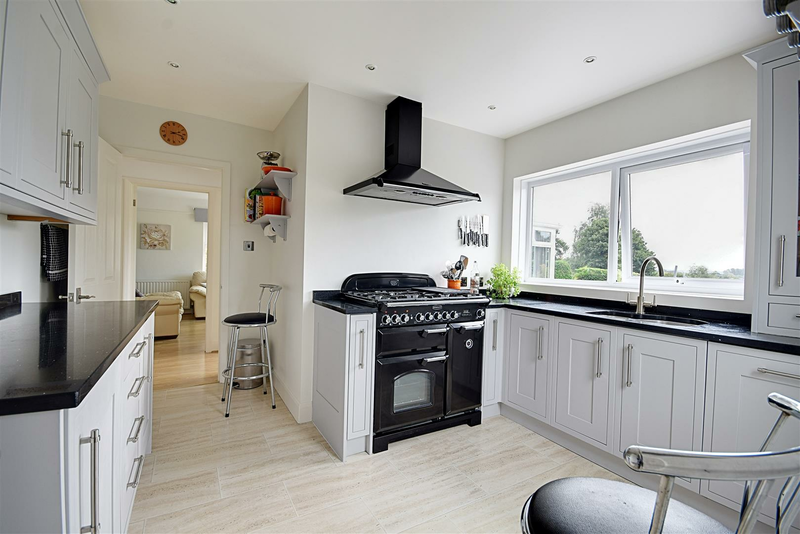 Internal door, oak effect laminate flooring, window to side elevations, internal glazed doors to adjoining conservatory to rear, feature fireplace housing an inset multi-fuel stove over slate hearth, floating shelving to alcove, double radiator, TV point. 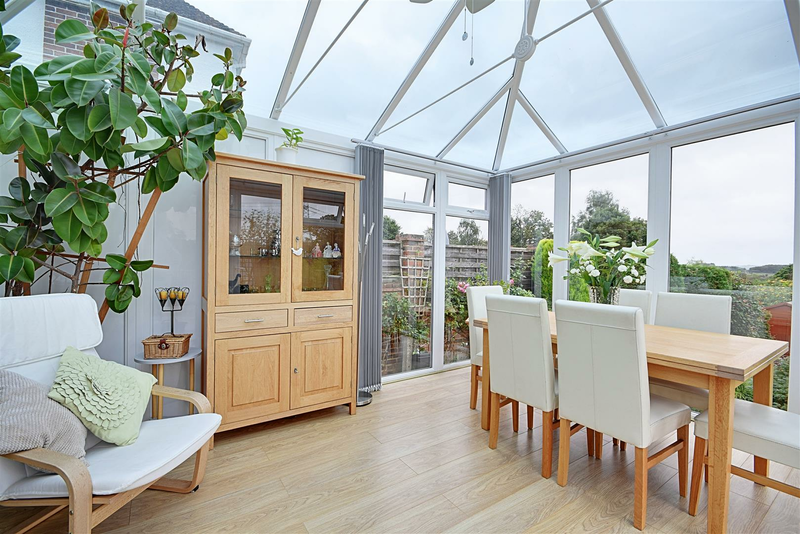 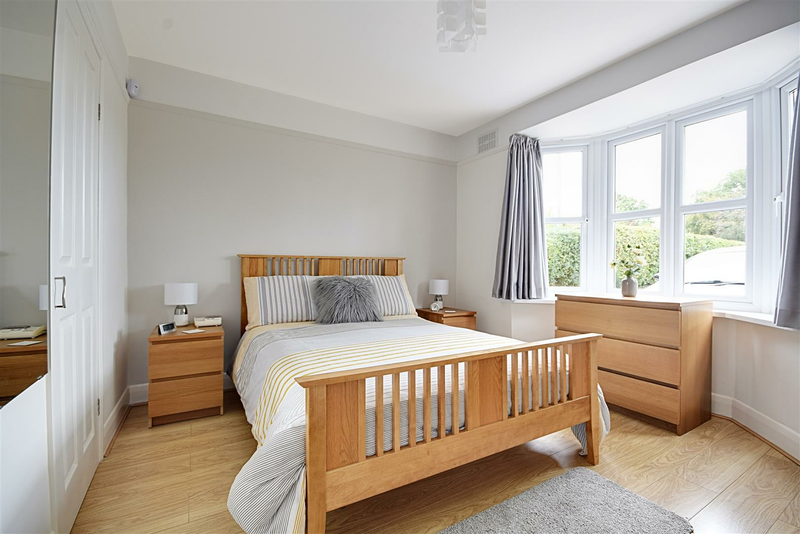 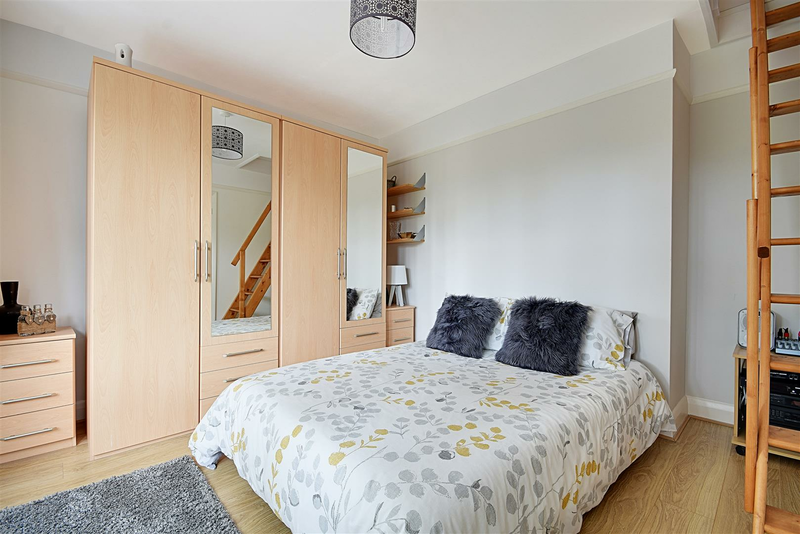 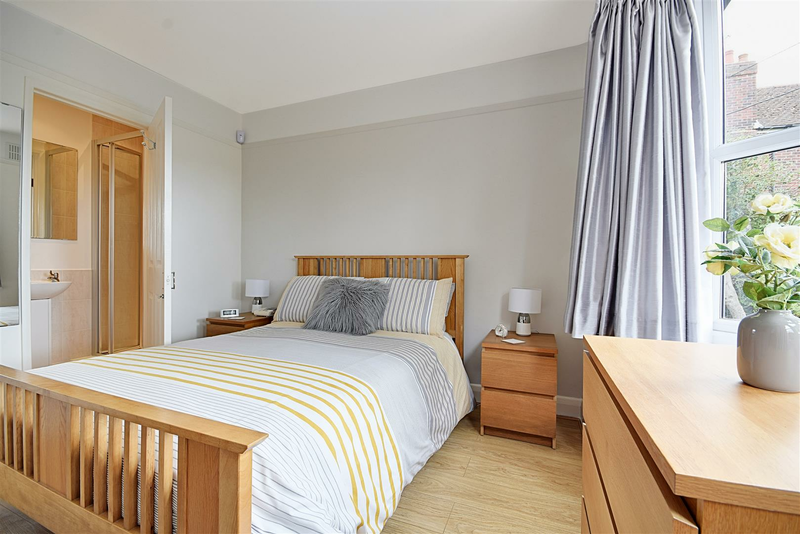 Internal glazed doors from living room, oak effect laminate flooring, french doors to rear decked terrace, full height glazed windows with fitted blinds, single radiator, ceiling fan, telephone point and power point. 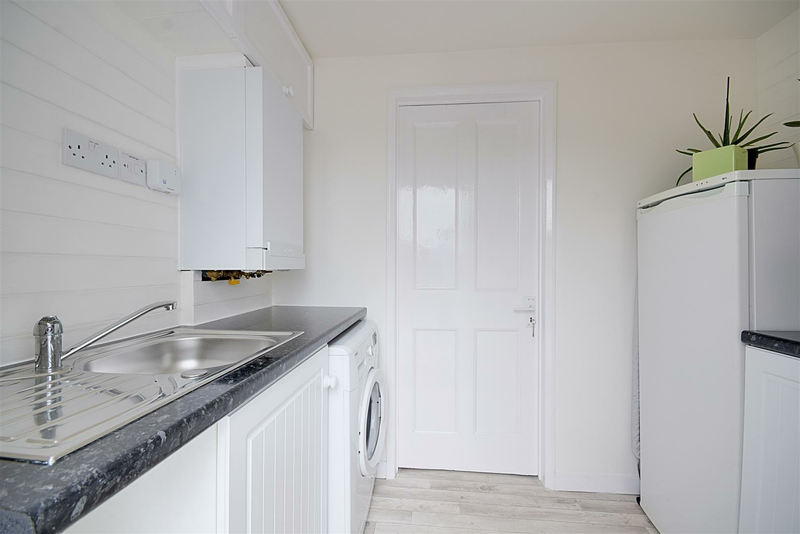 Manual up and over door, power and light, garage has been divided internally to incorporate utility room, internal door to utility space with further external door to rear deck, wood effect vinyl flooring, fitted base unit with granite effect laminate roll top work surface and single stainless bowl with mixer taps, wall mounted Viessmann gas boiler, plumbing for washing machine below worktop, cupboard housing electrics and consumer unit, further base unit. 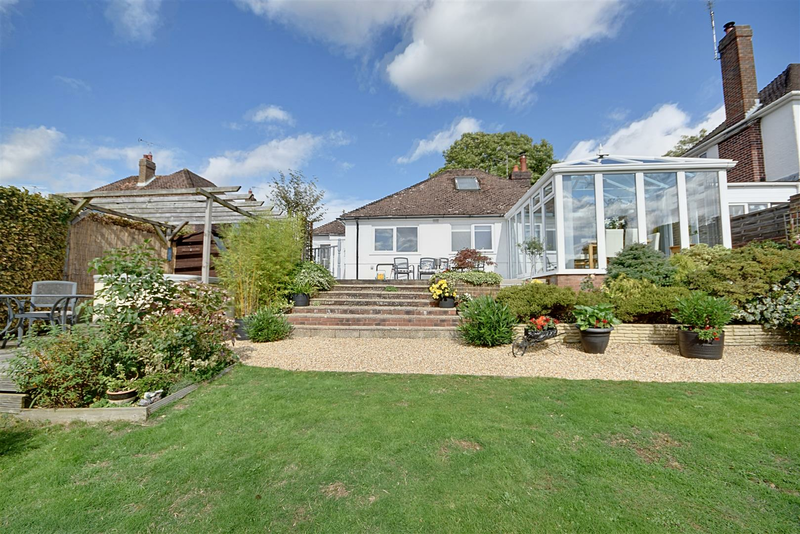 The property enjoys a pleasant south facing rear garden with a large decked terrace leading from the rear of the property with access to both sides, steps extending onto rear lawn with decorative shingled path garden lighting and brick edged planted borders, path leading to potting shed, garden enclosed panelled fencing, mature hedgerow and shrub borders, further decked seating terrace to side with hot tub and pergola over, feature flower beds within lawn, shed/workshop over hard standing, selection of fruit trees to far end of garden , external power points and tap. 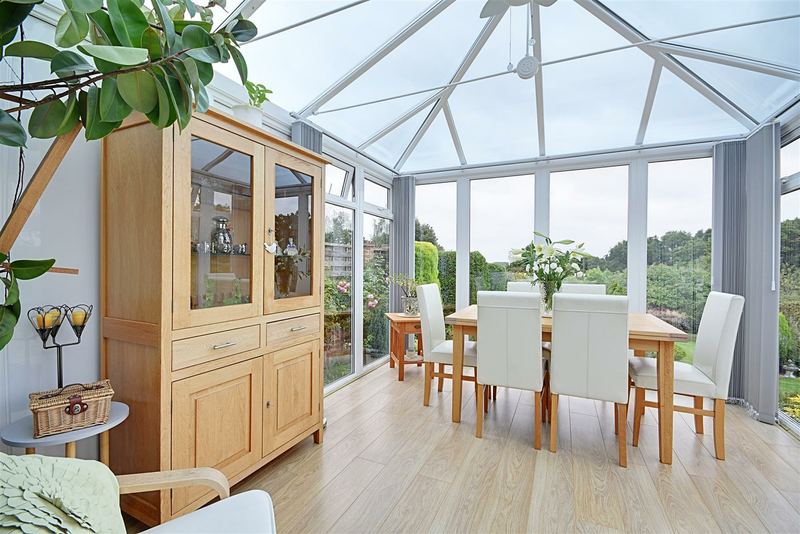 None of the services or appliances mentioned in these sale particulars have been tested. 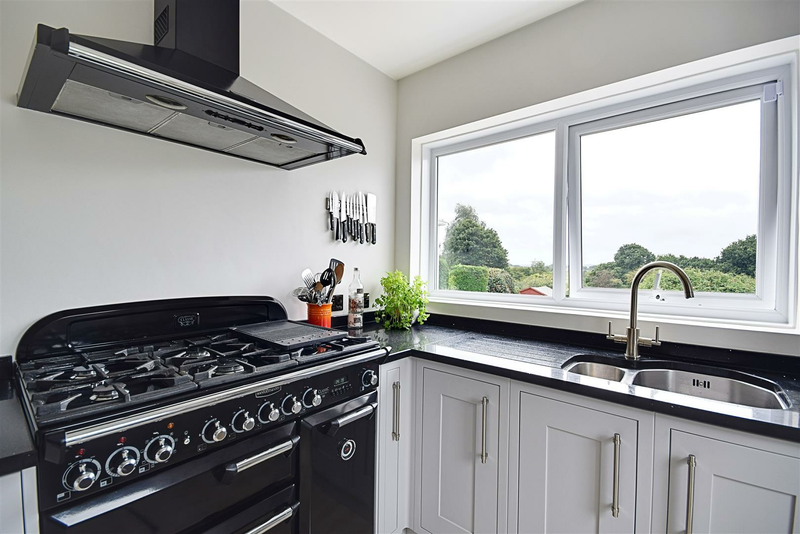 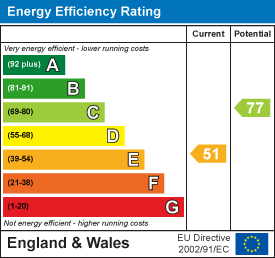 It should also be noted that measurements quoted are given for guidance only and are approximate and should not be relied upon for any other purpose.